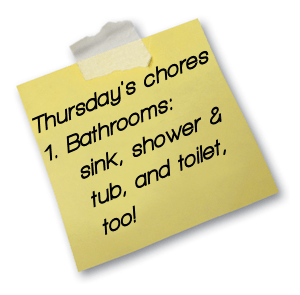 Here’s a weekly chore schedule to help keep a clean house. Home Ec 101 gets a lot of requests for help figuring out how to get and keep a house clean. There’s no big secret here, it’s just a matter of dividing the chores into manageable chunks. Each day has one major chore and a minor chore to keep the routine simple. Once you have the hang of what’s expected click the image for a handy printable pdf for easy reference. Singles and couples who live in average sized homes will find the chores go quickly (and better still when labor is fairly divided). It’s the nature of the beast, but families with young children will find routine chores take a little more time. Effort spent teaching young kids to be helpful will pay off as they develop the skills to be a real help. Invest the time. Remember clutter makes cleaning hard. Transparency: When I stick to my own advice, this routine keeps the house company ready with 15 minutes warning or so. When I don’t, a little more preparation is needed. I do laundry throughout the week, but Mondays are the day to tackle the big items such as sheets and bedding. Sheets are done every Monday, and the first Monday of the month all blankets, mattress pads, and pillow casings are washed. This is also the day to put away all the laundry that seems to linger in the area I have set aside for folding. If there is any ironing, hand washing, or clothing repair needed, this is the day for it. Monday’s minor chore is a quick kitchen wipe down. All surfaces in the kitchen get a quick wipe for fingerprints and crumbs. The fridge is checked for science projects or items that need to be used quickly. Floors, this is the day for mopping and thorough vacuuming. During the week I sweep, spot mop spills, and vacuum the middles. My household also has three kids and a dog running in and out, tracking in dirt. In my household at least minimal daily upkeep is a must. If you are single or have no children, you will probably rotate which room gets the deep floor cleaning. The rule of thumb for carpeted rooms with high traffic (family rooms and hallways for example) is to vacuum once a week + one additional time for each household member. A household of two should need to vacuum the high traffic areas twice a week. Large pets should be counted as people. The frequent vacuuming keeps dirt from destroying the carpet fibers. Tuesday’s minor chore is a 15 minute pick up and wipe down. Misplaced items are rounded up and smudges and smears are wiped away. (Dog nose prints, kid fingerprints on switch plates, etc). Errand day. This is the day to hit the post office, make doctor’s appointments, refill prescriptions, and grocery shop. (And make all those phone calls, too) Since I end up spending a lot of time in the car, I also clean that out, filing receipts and mileage, as necessary. Wednesday’s minor chore is car and entry way clean up. Clear out the trash and vacuum the car if needed. Also, enter the home as though you are a guest and make sure the entry way is clean. Bathrooms in busy households should get at least a quick daily wipe down of the sink and toilet. With the daily wipe down a bathroom deep clean goes quickly. If your home has more than one bathroom, alternate which gets the deep clean, but make sure whatever bathroom guests use gets at least a quick cleaning. Here’s an unabridged post on How to Clean a Bathroom. If a household is large enough to have a bathroom for children, from school age on they should be in charge (with supervision) of that bathroom’s maintenance. It won’t kill a kid to wield a toilet scrubber and if they have to clean up what they dribble, boys quickly develop better aim. Check to make sure no bills need to be paid and that your checking account balance is where you expect it to be. It’s time for a deep kitchen clean up as explained by Ivy. Remember though her post is on Spring cleaning in the kitchen, a weekly clean up doesn’t need to be THAT thorough. The kitchen stove, counters, and sink get a quick wipedown after each meal which helps Friday’s chore go quickly. Friday’s minor chore is dusting, rotate which room receives the focus. In non-smoking homes, a quick weekly dusting should be all that is needed unless there are a lot of pets or tchotchkes. The more stuff you own, the more it must be cared for, don’t be scared to get rid of items you don’t love. Project day, this covers everything from yard maintenance to room painting. We don’t spend every Saturday doing these things, many Saturdays are family or friends days. The big chore is preparing for the week ahead. Find all the library books or movies that need to be returned. Pack bookbags or briefcases, menu plan, find missing keys or shoes. Look at the calendar and get a sense of what’s coming this week. Are there days that will be too busy to cook? Plan foods to grab and go. Are there meetings or school pictures that require nice clothing? Figuring it out now prevents panic the night before -or worse the morning of. Doing these things helps keep the budget on track and prevents Monday morning from being a big hassle. Set a timer and put things away for ten minutes. If you have kid, spouse, or roommate, get them involved. Need help with dividing up chores? Here’s a suggestion for dividing the labor fairly. Heather, I just wanted to share that I blogged about your sanity saving chore chart. Thanks so much for this post! Sunday’s advice is very good. Getting ready for the week ahead, in advance, makes everything go so much more smoothly. Apart from the shed where I keep my tools and my missus her gardening equipment, we keep our house as clutter free as possible. Instead of a big fridge we have a small-ish one with a separate freezer unit – that way we don’t tend to buy and keep too much food items and condiments in them. If a takeaway comes with ketchup packets we keep them as well. You’ll be amazed how much longer these little ketchup packets keep us away from buying a new bottle. When things are overflowing from cabinets and drawers, it’s time to give, recycle, gift or throw stuff away. Oh the word "clutter" makes me "shudder"! I for the life of me and my family cannot get through the working week without seeing the entire, or what feels like, house contents on and around the kitchen bench. Solutions are accepted graciously. have really enjoyed your blog. Great tips! Thank so much! Great tips! Thank so much! Just found your blog and I am pouring over your tips and advice. As a stay-at-home wife, I love to do my job well and your suggestions are helping me do that! Cheers! My recent post yippeee were home! I love your website! Just recently got your Kindle version of your book, too. Lots of wonderful suggestions. Your cleaning schedule is suiting me great, too. The graphics and style of your website and book are so cute, and retro ideas and images are so popular now. Have you ever considered offering your own cleaning or cooking products with a similar flair? I imagine they might be well received. Thanks for all of the great information. I have learnt a lot today and make me knowledgable.thank you. Thanks SO much for visiting my blog. I love yours and have it bookmarked. Once I'm a SAHM I'll be using it for sure, you have great recipes! I'm now 20 weeks along, just behind on getting the photos posted! Bedrest is over and the baby is doing great! This is perfect for my NY's resolutions! My recent post SNOstalgia – The Thrift Version – Updated! I have 2 children and my oldest son is ADHD. I find it's more stressful assigning him to do a chore than it is to take on the whole load myself! He can't retain even the simplest instructions and becomes distracted every 10 seconds, therefore, prolonging something that would take me less than a minute to do myself. I end up constantly repeating myself and nagging him to stay on task. I LOVE your idea of the chore notebook! This is the perfect way for him to contribute to our household and gain some independence! When my children were little, we had a chore notebook, with detailed instructions, for each room, behind a sheet protector. There were always little things that even a young child could help you do all around the house. Love the list! I've been wanting something like this since I'm heading back to work full time and I always find that a big adjustment. I noticed there was no minor job on Thursdays, but since I had glass cleaner in my hand…I did a quick wipe-down of all the windows. Thanks for all of the deep clean links too! Wow. This site is awesome. I just recently became a stay-at-home mom, so in my eyes, keeping the house up is now my "job" since my husband is the one bringing in the moolah. After working for so long, and sharing the chores, it's hard for me to find a rhythm that works. I'll def be giving this regime a go! Thanks! Hi Amy, you certainly aren't alone with a lot of calls on your time. The quick answer is wipe key points of the bathroom each day, Toilet after its first use in the morning, squeegee the shower or wipe out the tub after its use, wipe the sink before bed instead of letting the toothpaste harden. 90 seconds – 2 minutes daily prevent the need for an intensive clean on its assigned day. A few other things are daily, transporting laundry to the laundry room, putting away folded items, making the bed, doing the dishes, etc. I'll address this further on Wednesday of next week. I love your site and I want to love this chore list, but I don't know how to make it work for our family. We have a 6 month old, a toddler, and two hairy cats. I work part time and have two days during the week to do chores. Can you suggest a 4 day chore chart and/or how to get chores done with two young children. We can manage to pick up clutter, keep up with the laundry, and make home cooked meals. I do spot cleaning of the floors, bathrooms and kitchen when necessary but have a hard time fitting in bathrooms and deep cleaning. Suggestions? Thanks for this list! I just found your site and love it! I am organizationally challenged but try my hardest to make it work. I am printing this list off and hanging in my house so that I can have it all the time to remind me! I like the way you have divided your chores across the week. In particular, I appreciate your suggestion to include others, such as children, in the household chores. It's good for children to understand that everyone must contribute to the upkeep of the house. Similar to your list for yourself, young children may benefit by having a similar list customized for their responsibilities. Each chore may even need sub-chores to help a child tackle a big action item. Thanks for your post! Thanks for visiting my site, and for recommending yours! This is really helpful. I feel weird, at thirty-six, just learning how to keep house, but I clearly need some sort of system. You've got a lot of great stuff here. I'll be back for sure! I'm exactly the same age as you are, and I'm still trying to find a system that works consistently for me!